Belly Dance with Nisaa presents George Dimitri Sawa and Suzanne Meyers Sawa in St. Louis! Arabic music appreciation course for dancers, plus a live performance open to the public, featuring live music by the Sawas. Details to come! Save the date! Summer session classes in all proficiency levels begin in June 2019. Register early and save! Visit here for details and registration! Nisaa's book is now available! Follow the Amazon link to the right or click here! You can also order directly from the publisher here. Learn more about Nisaa's research here. This is the 15th annual recital featuring Nisaa's students. Tickets available here! Now Available: Online Lectures with Nisaa! 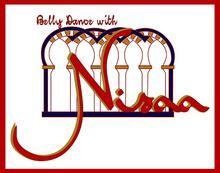 Nisaa now offers online lectures on a variety of cultural and historical topics related to Middle Eastern dance! Visit here for details! Always wanted to try belly dance, but not sure if you're ready to commit to a full session? Here's your chance to try and see if belly dance is right for you! Details and registration here. Belly Dance with Nisaa has been featured on Schankmann's St. Louis on HEC!